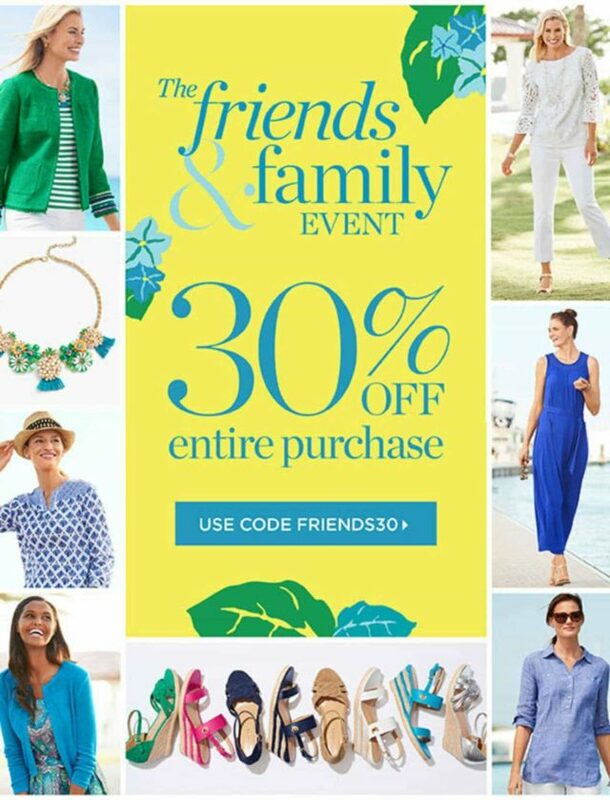 If you're a Talbots cardholder, you likely already shopped the 30% off Friends & Family Talbots sale this week. For the rest of us, it kicks off TODAY through April 30th and you get 30% off your entire purchase with the code FRIENDS30. You all know I am a fan of Talbots; I went through their site and made a list of all my favorite items, reviews of those I own, and tips on how to style. I recommend you do not wait for this sale; in the past I have and items I wanted were sold out. If you shop the Talbots Friends & Family sale, do share in the comments what you got and what you think of your purchases! While the temps may be rising outside, there’s still a need for great jackets and cardigans in your life. Overly-air conditioned offices, cool evening breezes by the water, and vacations to cooler locations will have you grabbing for a lightweight topper. Talbots is always great for such pieces, and even better when they’re on sale! Embellished-Cuff Tweed Jacket: A little bit Chanel, but with a quirky twist. The color is gorgeous, and the detail at the cuffs makes it unique and a piece you’ll love wearing for years. Style with a white blouse and trousers, over a sheath dress, or with your favorite t-shirt and jeans! Misses, Petite, and Woman sizes. Stripe Lightweight Blazer: With the same cool collar as my ivory Talbots blazer, but in a lightweight pink or blue seersucker perfect for the season. Pair with a Breton striped tee, your favorite message t-shirt, a simple tank or v-neck… this is the perfect spring and summer topper to turn your separates into an ensemble. I am partial to the pink, which I think looks fresh and somehow a bit more tough. I’d roll up the sleeves, pair with a slouchy linen v-neck tee, well-worn jeans and my Pumas. Misses, Petites, Woman, and Woman Petites. UPDATE: Talbots sent me this jacket in pink yesterday and it's really nice. Crisp, but breezy, lined in white with tiny blue dots so it looks great if you cuff the sleeves. A 14P is a very trim fit on me, not tight but this is a very tailored jacket that hits high/mid hip. I think it would look better with a white v-neck than a band tee, and now envision it with a striped tee and white jeans. White Lightweight Blazer: Same shape as the striped one, but in crisp white. If you don’t own a white blazer you don’t know what you’re missing. My white blazers get worn more than my black or navy because they take every look up a notch. A bit more polished, a bit more chic. Misses, Petites, Woman, and Woman Petites. The Classic Denim Jacket – Lowell Wash: Sure, you can find cheaper denim jackets, but will they get such glowing reviews for fit, flattery, stretch, and comfort? Like a lot of reviewers, I often find denim jackets too boxy and just emphasizing my curves in a negative way. This jacket seems to not do that per comments and I am really considering buying this during the sale to check it out. Also a fan of the classic color and styling. Misses, Petites, Woman, and Woman Petite sizing. UPDATE: Talbots also sent me this jacket in a LP. The wash and details are truly classic, but this fit is far more feminine than most classic denim jackets. The collar is slimmer, which I think is more feminine too (and you can pop it easily, which I love to do). The LP is a perfect fit, even with a lightweight sweater. Casual Vest: Desire the styling capability and storage of a jacket but can’t stand more bulk in the warmer months? Consider this vest. A modern-take on safari style, this vest is made of a lightweight fabric, nips in at just the right place (and is adjustable), and adds style without too much weight. Three great colors to choose from. Misses, Petite, and Woman sizes. The same vest but in chambray. Double-Breasted Blazer: I have been loving unbuttoned double-breasted blazers lately. They hang in a way that is so flattering and effortless chic. This one can be office-elegant in black or perfect for the weekend in sunny yellow. Misses and Petites. 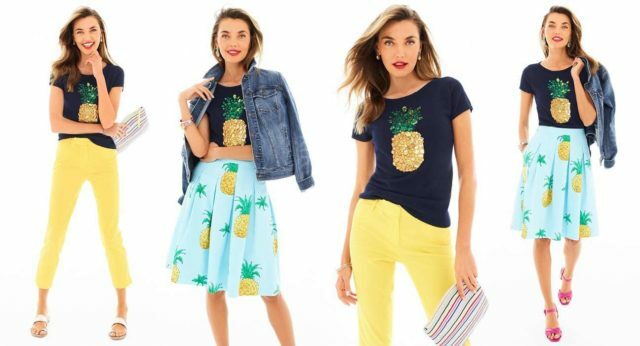 Sparkle-Embellished Pineapple Sweater: Summer is the time for fun fashion and this short-sleeved sweater tee is so much fun! This is the kind of top you can wear on its own with white pants or jeans, throw on with your favorite denim, or glam it up with a white blazer or a full skirt and sandals. Unlike the sequined t-shirts of tweens, this is an elevated, sophisticated sparkle and a piece you’ll look forward to wearing each spring and summer. 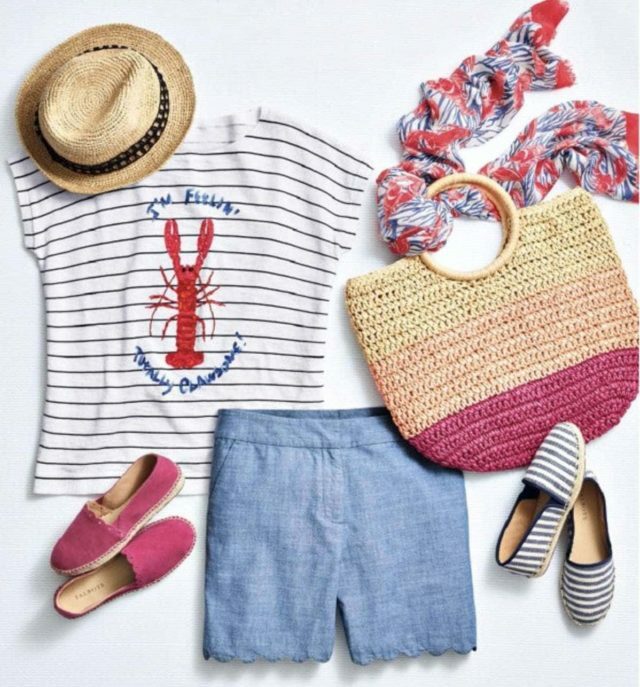 Lobster-Embellished Statement Sweater: Reminiscent of summers in Maine as a kid, I love this striped top with a cute lobster theme. Like the pineapple sweater, this is an elevated novelty top that goes beyond denim shorts and sandals to look chic with blazers, skirts, and crisp white trousers. Misses, Petites, Woman, and Woman Petite. Tie-Front Top: I owned almost this exact top when I was pregnant and I always wished I could find a non-maternity alternative. The knot detail whittles the waist and adds interest without looking lumpy under blazers and cardigans. However, this is a top that can stand on its own and is perfect for hot summer days at the office with suiting trousers or ankle pants. Two perfectly summer colors to choose from. Misses and Petites. Tie-Front Top – Casting Tile: If pattern is more your thing, this is the same top but in a versatile and elegant navy print. Misses and Petites. Square Neck Elbow-Sleeve Sweater in Topper-Resort Stripe: You better KNOW this top will be added to my wardrobe! I love a striped top with a flattering neckline. Being a sweater knit, it’s more polished than a standard t-shirt and will work under blazers and with skirts for days in the office. However, you can still pair with shorts and jeans on the weekend. All three color choices are awesome, though I’m really feeling the green color this season. Misses, Petites, Woman, and Woman Petites. Womans Exclusive V-neck Sweater Shell: This is the top you’re always wishing was in your closet or drawer when you’re running late for work or lunch with your friends and want that something to go under your blazer or utility jacket or with your linen pants or your midi skirt. Knit from linen, it can dress up and down with ease and be comfortable under the summer sun. Five colors to choose from. Woman and Woman Petites. No-Close Linen Cardigan: Pair this with the shell for an elegant twinset that’s perfect with chino cropped pants or silk trousers. Six colors available. Misses, Petites, Woman, and Woman Petites. Trapunto Stitch Shell: I received this top as a gift from Talbots, size Large Petite in the color Navy. This is a fantastic summer shirt. The neckline is flattering but no cleavage shows. The armholes cover your bra but aren't all weird and high. It's a straight fit that doesn't tent out, two little side slits at the hem, hits mid-hip. Would look great tucked in our bloused out. Misses, Petites, and Woman sizes. Bateau Tee – Summer Stripe: This was also gifted to me by Talbots, size Large. I love a rainbow stripe, but at first thought this looked a bit juvenile. However, once on, you see the top is well shaped, a mature bateau neckline (wide enough to flatter but not so wide it shows your bra strap), bracelet-length sleeves, almost goes down enough to cover my crotch (less than an inch showing, whole zipper covered). Talbots makes great knits that are stretchy, thick, and refined and this is a perfect example. I paired it with the white Perfect Crops (mentioned below) and thought it to be that perfect outfit for dinner at a friend's house, lunch out, or one of those occasions where you know people will be in everything from dresses to denim shorts and you want to look good but not too done up. Misses, Petites, Woman, and Woman Petites. Colored Denim Crop Jegging: I sometimes find Talbots jeans to run a bit loose in weird places and not flatter my specific shape. But their jegging works really well for me. I also have found Talbots to usually have opaque flattering white jeans. I love the cropped length for spring and summer, and all three colors available (pink, olive, and white) are perfection for spring and summer. Misses, Petites, Woman, and Woman Petites. UPDATE: Talbots sent me these in hot pink size 12P as a gift. They fit like a jegging – very slim and trim from waist to ankle. However, they are a nice weight so they don't show every lump and bump. These are high waisted, even with a petite they end above my belly button, but at my natural waist curve so they stay in place. They started snug but with wearing stretched to be more comfortable without getting baggy. The pink is Barbie Corvette pink which I love, and think would look amazing with chambray, seersucker, navy, and black and white. Womans Exclusive Denim Jegging – Curvy Fit/White: Great fitting jeans are hard to find, it’s even harder when you want a pair of white denim. These are made to flatter and fit a curvy figure, and are made of Talbots’ opaque quality white denim. Woman sizes only. 5” Perfect Short: The perfect of short varies depending on your height, shape, and lifestyle needs. However, I’ve found a 5” short to be pretty perfect for many people and situations. Not too long, but long enough to cover and prevent chub rub. This one comes in five colors, and Misses up to 18 and petites up to 16P. Talbots Windsor Wide Leg Pant: These are the pants I am wearing in this outfit post. I have a 14P which is pretty perfect. I’ve washed these and they haven’t shrunk or lost their color. Misses and Petites. Talbots Perfect Crop: I didn't originally have these in this post (I wrote this post Tuesday when I found out about the Friends & Family sale) but Talbots sent them to me as a gift, size 12P, color white. These fit me like they were custom tailored. I thought they would be see-through but I put them on with purple lace underwear and looked in a variety of lights and couldn't see them. I like that they leg is slim, it looks more modern. I also like the deep hem on the legs, which looks more expensive than a slim denim hem. These come in Misses, Petite, Women, and Woman Petites. While Talbots always has a great mix of dresses, I decided to stick to classic and versatile styles. But their dress department is worth a look during this sale! Solid Jersey Side-Tie Fit-and-Flare Dress: Here’s your perfect vacation dress. After being out in the sun, slide it on with sneakers or flip-flops for casual dining. Style with some low metallic wedge sandals for a nicer meal. Toss a cardigan or denim jacket over it when the temps drop. Once you get home, style with pumps for the office and heeled sandals for a day wedding. It won’t wrinkle, and it’s cut to flatter your figure. Two colors, Misses and Petites. Audrey-Neck Interlock Shift Dress: This is one of those dresses you’ll always reach for. Days when it’s too hot to think of what to wear to work, baby showers, brunch, day weddings, date nights, and it likely will be put in your suitcase for your next vacation. I love the neckline, I love how it’s a style that works with heels or flats, and I adore that it’s machine washable. Misses, Petites, and Woman sizes. Ponte Fit-and-Flare Dress: I always have a dress like this in my closet and it’s so great three seasons of the year. Dress it up with pearls and heels, dress it down with sandals and a ponytail. Pair it with sneakers and a denim jacket, with a scarf at the neck and sandals, with pumps and a ponte jacket for the office. Three colors. Misses, Petites, Woman, and Woman Petites. Belted Seersucker Fit-and-Flare Dress: Pretty, classic, versatile. This is the kind of dress you can wear to work, on the weekend, dress up or dress down. Consider switching out the self belt with another belt or even a scarf for a different look. I also think this dress would work over a short-sleeved fitted tee or button-front shirt to give a pinafore effect. Misses, Petites, Woman, and Woman Petites. Fresh Pineapple Fit-and-Flare Dress: I mean how cute is this? If fun fashion is your thing, this dress is for you! Misses, Petites, and Woman sizes. Talbots has really increased their swimwear line this year, and the quality is quite nice. I ordered one to see in person and think they rival the popular department store brands in quality, fit, and style. Marina Multi Stripe Swim Suit: I love a rainbow stripe, and this suit does it well – mature but fun, not too trendy or wacky but quite festive. With UPF 50+, all over compression, underwires and soft cups, and strategic shirring, this is a swimsuit that works hard while being quite flattering. Marina Swim Suit – DD Cups: If you’re a bit more endowed, Talbots swimwear has you covered… literally. The same style and features of the Marina Multi Stripe Swim Suit, but cut to support, cover, and flatter a larger bust. Womans Exclusive Marina Swimsuit: The same suit, but cut to flatter a plus size frame. Woman sizes only. Womans Exclusive Multi-Dot Marina Swim Dress: The same bodice of the above swimsuits, but with an a-line skirt and with pretty pastel dots on a navy ground. The site says Misses sizes, but it’s only available in sizes 16-24. Talbots, you have back views for Misses suits but not Women, I hope you change that in the future because we’d all like to know the back and backside situation of any swimwear! Halter Swim Dress: Many choose swim dresses because they feel they provide coverage to camouflage the figure. The thing is many swim dresses add bulk in the wrong places and end up making you look bigger, less firm, and older than you actually are. I love swim dresses like this one that incorporates the skirt into the style, making it more flattering and more fashionable. The clean navy with white trim is classic and will be chic for many summers. Light control, soft cups, and an adjustable halter strap for a great fit. Misses only. Sarong Wrap Swim Dress: What a flattering suit! I love how you can adjust the side tie to shorten or lengthen the skirt. Light control, UPF 50+, strategic shirring, and soft cups. Two colors to choose from in Misses sizes. Beach Floral Cabana One-Piece: Last summer I bought a one-piece in a very similar pattern. Like this one, it was cute enough for laying out on the beach but practical enough for swimming laps and playing with the kids. The pattern was so pretty it got compliments from strangers, but was also an optical illusion that flattered my frame. With a hidden underwire bra, adjustable straps, and firm control, this suit will be a favorite all summer long. Misses sizes up to 16. Cut-Out Halter Swim Suit – Citrus Print: This is the suit that I ordered. I ordered a 14, which I found was too large. If the color wasn’t so similar to my Boden swimsuit I would have exchanged it to see if a 12 worked. I do know with my short frame and large bust if I did keep it I would have had to shorten the straps. But the shirring is flattering, the pattern even prettier in person, and it was constructed quite nicely! Misses sizes up to 16. Crinkle-Cotton Beach Shirt: I bought an extremely similar cover-up from Tommy Bahama last year and it has been SUCH a good buy! It dries quickly, covers enough without being bulky, has pockets, and if you’re leaving the beach or pool for lunch or a drink, you can style it with wide-leg chambray or linen pants or a pair of shorts and look quite chic. Misses sizes only. I love Talbots for shoes. They do a great job of making shoes that are quality, stylist, but not too pricey or too trendy. Even better, many of their styles come in a variety of widths! Lyndsay Espadrille Wedges: If you’re looking for one shoe to add to your wardrobe this season, you can’t go wrong with this pair. The espadrille trend isn’t going anywhere, and this moderate wedge height it perfect for everything from capri pants to maxi dresses. All three colors are excellent; while it may be tempting to go with a neutral don’t discount green as an unexpected color to complement most of your wardrobe. If a metallic is more your thing, here is the same shoe in a beautiful silver. UPDATE: Talbots sent me these in navy and they look just as lovely in person. The suede is soft, the rope is secure and looks nice not cheesy. The bottom is a mix of rubber and rope, so you are secure on slick surfaces but still have the classic espadrille experience. The insole is slightly padded leather. They're narrow on me, but I usually need wide widths sandals so I'd say they run true to size. Siena Rope Heel Sandal: The classic heeled sandal for summer, updated with a rope-covered block heel. The marriage of rope and gold leather makes this a perfect shoe to wear with your favorite jeans or a silk dress for a wedding. If patterns are more your thing, this is the same shoe in a fun print that will add interest and color to all your outfits. Capri Leather Sandals: With a subtle 1” heel, this strappy sandal is a wearable (and danceable) height for all your spring and summer activities. Plenty of positive reviews as well. Available in five colors. The same shoe, but in metallic options. Capri Mini-Wedge Sandal: Prefer flats? This shoe is practically flat, but has a hint of lift to flatter and to add elegance. This shoe will work with most everything in your wardrobe in regard to style and color. If you’d prefer a color, this link has the same shoe but in pink, aqua, navy, and black. Issa Pom-Pom Pumps: I have these in the stripe and they are soo cute! They add fun to simple dresses in your closet and look adorable with ankle pants and cropped jeans. http://bit.ly/2K83exG This is the same shoe, but in two great statement colors. Some of the highest quality bags I own are from Talbots. They’re also smartly designed with plenty of pockets, adjustable straps, and secure closures. Woven Crossbody Bag – Indigo: This is a perfect size bag to use most everyday. Fit your wallet, sunglasses, phone, a small bag of beauty and purse essentials and even a snack without carrying a huge tote. The crossbody strap is convenient so you can look chic while keeping your hands free. The indigo color works with denim and chambray, but is also a neutral that will complement your entire closet. Paper Straw Bucket Bag: Bucket- and basket-style bags are a hot trend this season, but also a look that is always chic each summer. This bag has an adorable gingham lining and magnetic closure and comes in two great colors. By far the most elegant straw bucket bag I’ve seen sold anywhere. Crochet Straw Circle Crossbody Bag: I’ve already discussed the circle bag trend; this is a perfect option. The ticking stripe and navy leather trim are chic but also timeless. This is the perfect bag for boyfriend jeans and Breton tees or your favorite crisp cotton sundress. UPDATE: Talbots sent me this bag yesterday and it's adorable. It's about as big as a dinner platter, hand-crocheted wicker on the sides and blue and white ticking stripe fabric between. The navy leather cross-body strap is adjustable and removable; the handles are long enough to comfortably carry this bag in your hand or even the Croo of your elbow. Gold hardware. One compartment inside with a zipper pocket on one side and a pouch pocket on the other. Flamingo Pin: Pins and brooches are back and Talbots makes some of the best. The quality is really stellar, I have a few and they never get dull or chipped with age and are super sparkly and have a great weight. I’m all about quirky pins like this one – add it to a simple grey sheath, pin it to your denim jacket, put it on the lapel of your blazer, or pin it somewhere unexpected like on your clutch purse or on the front pocket of your jeans. Bluebird Brooch: I mean, come on how cute is this? I just want to put it on a beat up denim jacket or pink blazer and listen to all the oohs and aahs from those who see it! Multi-Color Dragonfly Brooch: Another cutie, but a bit more understated. This is one that would look great on the lapel of your navy pantsuit or pinned to your floral scarf. Flower Stud Earrings: I am loving plastic, lucite, and resin earrings for summer. They’re lightweight, colorful, and don’t heat up like metal jewelry. These are small but not at all subtle and can add that missing something to simple looks or add the cherry on top of your favorite outfits. Next Post Universal Standard Now Has Petites! Thank you for this post and all the details! I immediately ordered a bunch of the items you suggested including the green sandals (would not have thought of that on my own! ), got my big ol’ package today and everything fit great and I LOVE my new clothes. I splurged and got pink crop pants, 2 jackets, the denim vest and some tops. Alison, thank you! This is my first time leaving a comment but want you to know I read your blog daily and so appreciate you and your style. Keep up the great work! I just ordered the denim jacket. I figured I could splurge some my current one cost 50 cents at a garage sale! I used code FRIENDS40 and in addition to the 30% off I got 40% off a regular price item! Score!! Just a suggestion for the future, if you don’t mind – at the beginning of the post, you provide a photo for each item, but then after that it’s just the widget at the end of each section. Whilst the carousel is useful, unfortunately the items don’t appear to all be in order according to how you talk about them (eg – the bags & accessories section). Can I suggest that you show the widget at the TOP of each section & in order, so that it’s better to visualise each item with its description (rather than having to wait until the end to match the descriptions)? Even better would be if each individual item could be displayed right alongside its relevant description, but I know that may be more work than just moving the preexisting carousels around, lol. Hope that helps – & remember that this is just a gentle suggestion, not a demand lol! I am favoring the white blazer. The thing is that the ad says dry clean. Me with a white garment that has to be dry cleaned? Recipe for an expensive adventure. The blazer is linen. Do you think it can be machine washed in cold water, Woolite, and air dried? Thanks for a great Talbot’s list! It’s hard, with a blazer machine washing can distort the shape and can shrink fabric causing it to never lie correctly again. I would totally spot clean such a blazer though! Talbots definitely has some great choices right now. I find I go back and forth with them–some seasons, I like what they’re offering, then other times, everything seems a little too “old” looking for me. I did order a swimsuit (really a tankini) from them last year in a vibrant red/orange color. It’s well made and looks really nice. Lands End is my usual place for good swimsuits but this was very similar in quality. We used to have a Talbott’s here and I miss them. I am retired with a large waist and chest, long frame and short legs. The pineapple shirt is cute but I have an aversion to people staring at my chest!!! I live in a town that is very casual and need to find clothes that work. The crop pants might work. I will have to try. Their shipping and returns is so easy, it’s worth it to try. Good luck!